It takes a lot of money to pay for the glittery, balloon-strewn, optics-heavy spectacle that is the nominating convention, and both the DNC and RNCC have come up with some suspect strategies this week to deal with costs for their respective conventions next year. It started at the beginning of this week, with the Republican National Convention Committee deciding it was going to have journalists pay their way, to the tune of $150 for a seat on the press stand set aside for newspapers/magazines/wire and digital print pub reporters. Seats in this section are normally offered gratis. Later in the week, the Democratic National Committee decided to focus its fundraising efforts on the fundraisers, falling back on the ol’ dollars-for-access bartering system between lobbyists and politicians. The Hill’s Megan Wilson reports that DNC chairwoman Debbie Wasserman Schultz met with a number of lobbyists to persuade them to bundle, bundle, bundle for the convention. VIP treatment that includes a photo-op at the official convention podium, access to a “premiere hotel” room in the same block as the National Finance Committee and access to celebrations “featuring celebrities and other luminaries, live music and Philadelphia’s most recognized chefs” every night of the weeklong convention. This is all made possible thanks to the DNC’s decision to roll back 2008 and 2012 convention rules that prevented lobbyists and PACs from doing exactly what the DNC is now encouraging. And the lobbyists sure are excited. 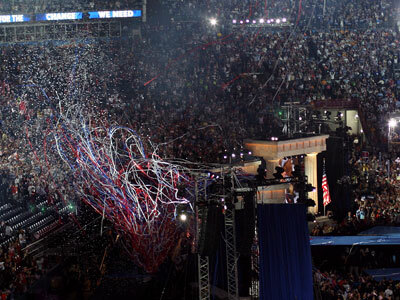 “This time around, it’s going to be a blast, because now we don’t even have the pretense of public financing behind the conventions,” Craig Holman, a government affairs lobbyist at Public Citizen, told The Hill earlier this year. First Amendment, we hardly knew ye.